Yesterday I mentioned that I was playing a game and kept seeing this chocolate cake in the game. Now, cake isn’t usually my dessert of choice but if I’m going to have cake I prefer chocolate cake with chocolate frosting. 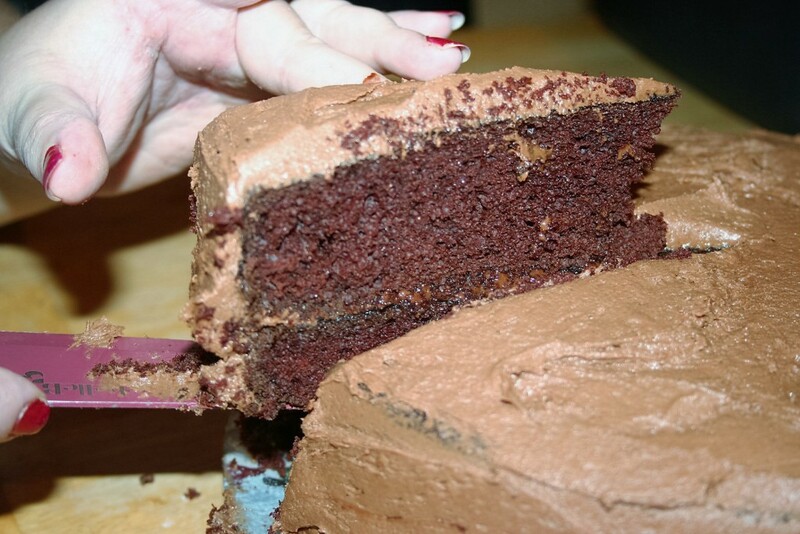 Devil’s food cake is my favorite. I’ve only ever made cake from a box mix and when I did, I made either a sheet cake or a bundt cake. I’ve never made a two layer cake before but that is what I was wanting now. So, I looked through my cookbooks for a recipe and ended up with old faithful, Better Homes and Gardens New Cook Book. I was thrilled to use my Kitchenaid mixer. Only problem was that this recipe called for whipping the egg whites and folding them into the rest of the batter at the end and my mixer has only one specific mixing bowl that can be used with it. I had a dilemma. Now none of the box cake mixes that I used ever had me whip the whites separately but finally decided to whip them first and put them in a different bowl until I needed them. I was nervous about these because I was supposed to whip them to soft peaks, then add 3/4 cup sugar and continue whipping to stiff peaks but I got to stiff peaks too quick. I went ahead and added the sugar but then struggled to get stiff peaks again. They did eventually arrive though. 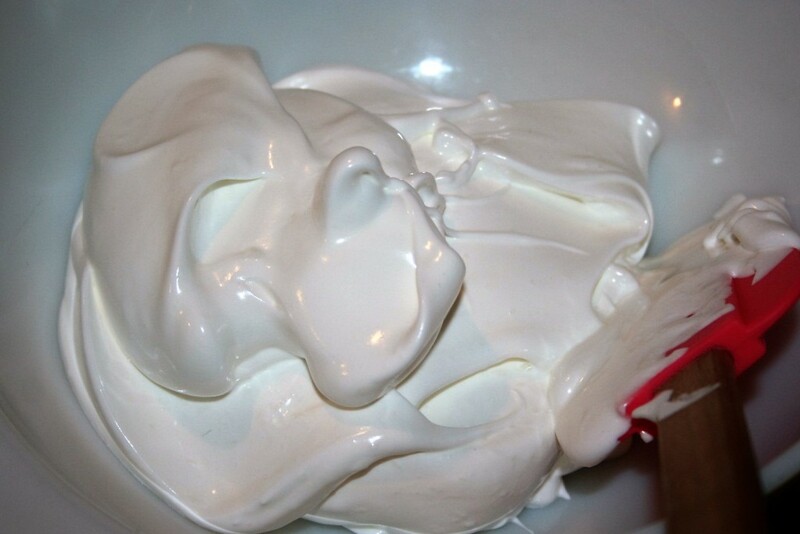 I think it looks a lot like marshmallow fluff. Next up was to cream the shortening and one cup of sugar. When it is light and fluffy, start adding the egg yolks, one at a time, with the vanilla (which I got in Belize ). Next up is to sift together the cake flour, baking soda, cocoa, and salt. This is added alternately with cold water. I’ve yet to get the hang of added ingredients to my Kitchenaid mixer. I spilled a bit on the counter. Next it’s time to fold the egg whites into the rest of the batter. Now I had yet another problem. I have 8″ cake pans and 10″ cake pans. 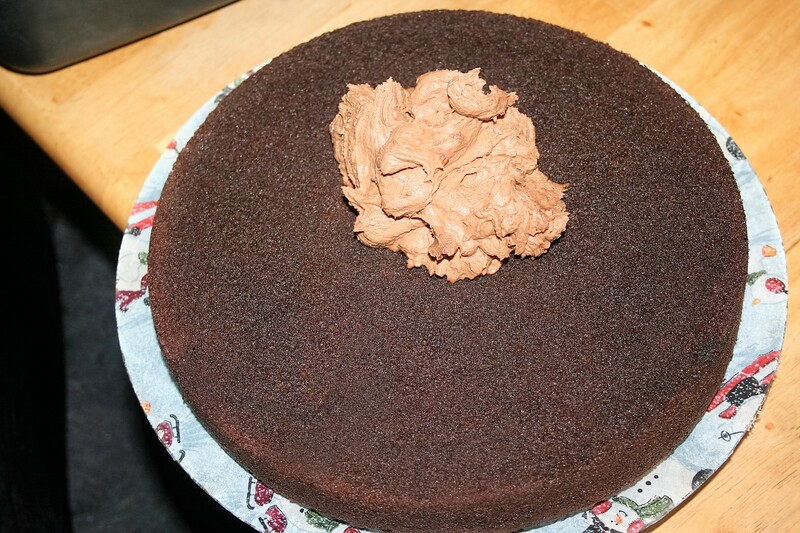 This recipe is for 9″ cake pans. 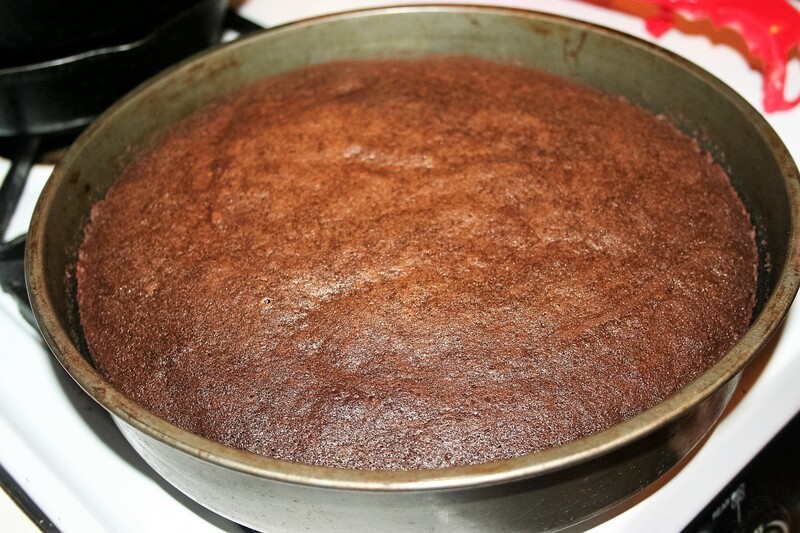 I chose to use the 10″ pans but unfortunately I forgot to reduce the baking time and it got a tad bit done . . . I prefer my cake slightly undone, which makes it very moist. Now for the frosting: butter, powdered sugar, unsweetened chocolate (melted and cooled), vanilla, and cream. 2 ounces unsweetened chocolate, melted and cooled. 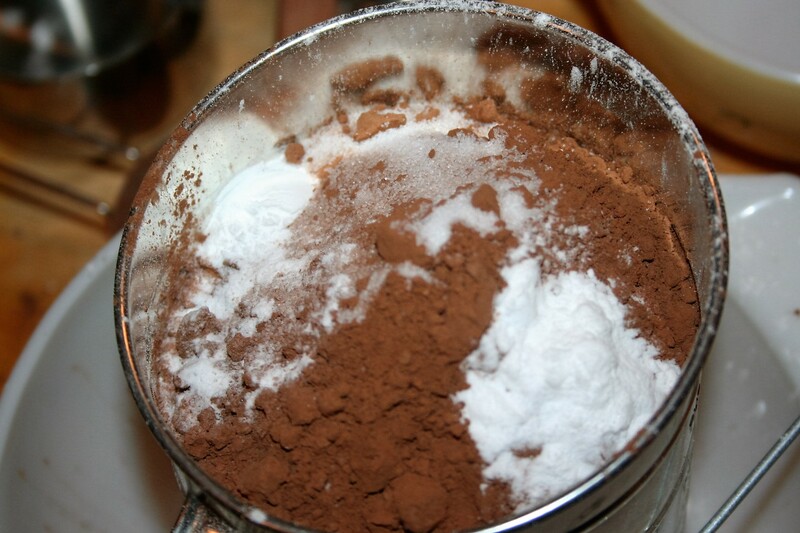 Cream shortening and 1 cup of the sugar until light. 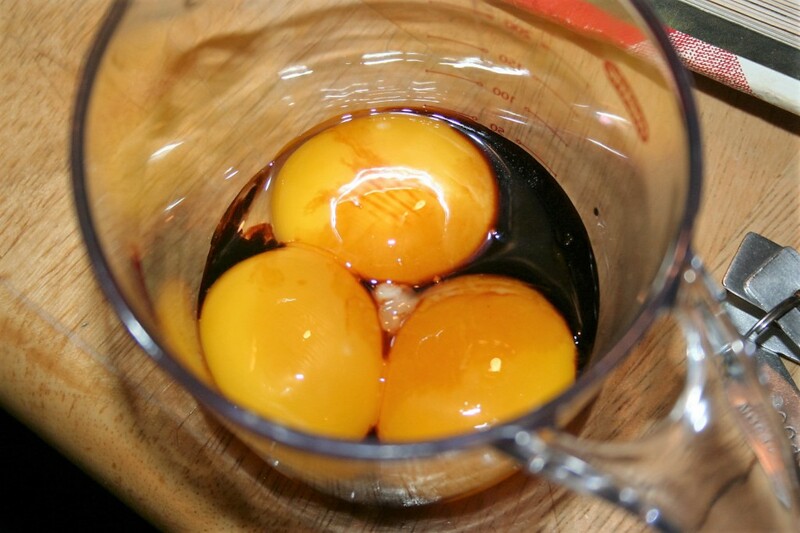 Add vanilla and egg yolks, one at a time, beating well after each. 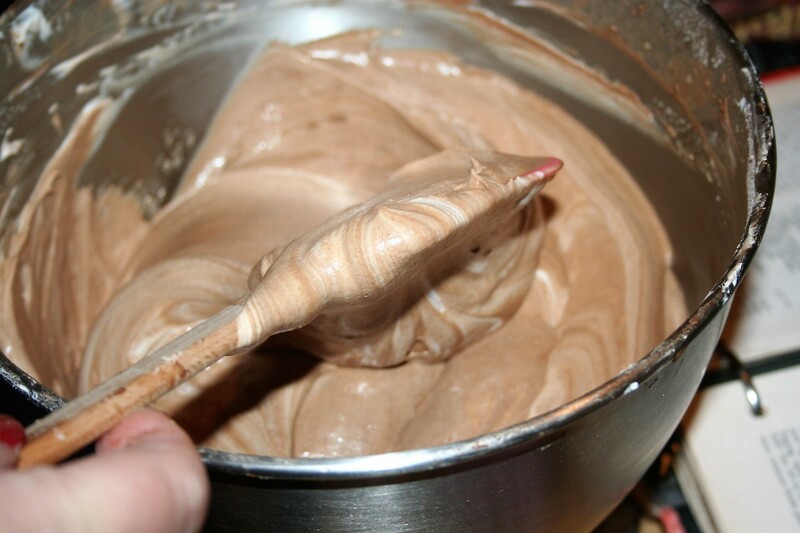 Add dry ingredients to creamed mixture alternating with the cold water, beating after each addition. Fold egg whites into batter and blend well. Bake in 2 greased and lightly floured (I sprayed mine with Baker's Joy) 9" round cake pans, at 350º for 30-35 minutes. Slowly add about half the powdered sugar, blending well. 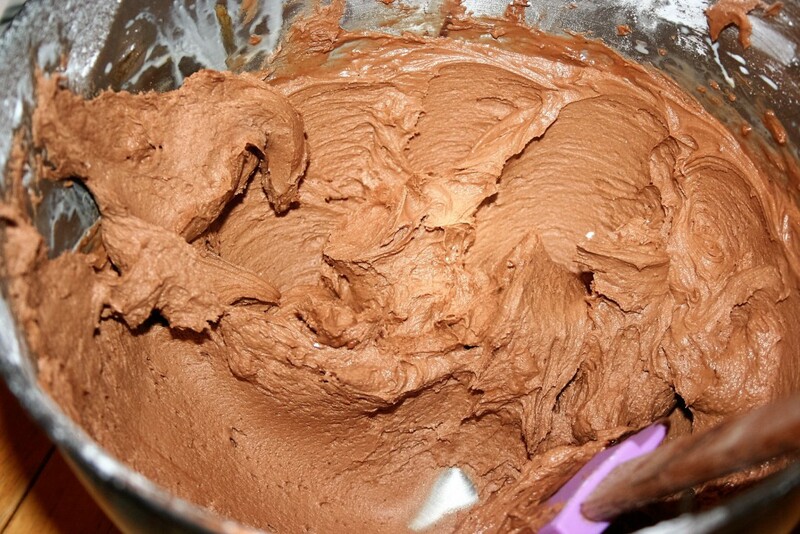 Beat in 2 tablespoons cream, vanilla, and chocolate. Gradually blend in remaining sugar. Add enough cream to make spreading consistency.